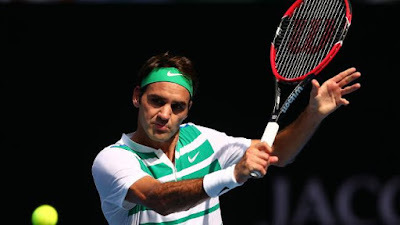 UNTOUCHABLE in perfect outdoor conditions in reaching a 12th Melbourne Park semi-final, Roger Federer is bracing for watershed change as the Australian Open reverts to heavier night conditions. While Federer has won three of four Australian Open titles under the Rod Laver Arena lights at night, he is even more dynamic in the livelier daylight conditions. His 80th Melbourne Park victory - 7-6 (7-4) 6-2 6-4 over Czech Tomas Berdych - propelled him into his 39th major semi and triggered immediate equipment and tactical change. The racquets will be strung differently and it is completely different here at night,” the Swiss master said. “In my opinion, Novak and Kei are some of the best returners in the game,” Federer said. In complete command against world No.6 Berdych, Federer boosted a phenomenal tally at Rod Laver Arena to 80 wins from 92 matches. Finding deadly range with 48 winners and only 26 unforced errors, Federer moved closer to winning his first major since Wimbledon in 2012. Since then, he has contested three major finals - including the past two at Wimbledon and the US Open - but has been foiled by Novak Djokovic on each occasion.